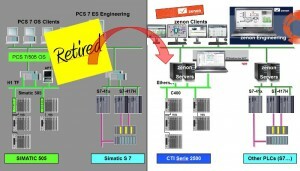 As you may have been informed, the PCS 7/505® SCADA system is being discontinued by its manufacturer. If you have invested in this system and are currently using it, or if you were envisaging to invest in this solution, we would like to provide you with some very important information about the long term support of your installation. The first very positive information for you is that your existing PLC system is absolutely secure and there is no need for you to invest in very risky and costly PLC hardware and software revamping. 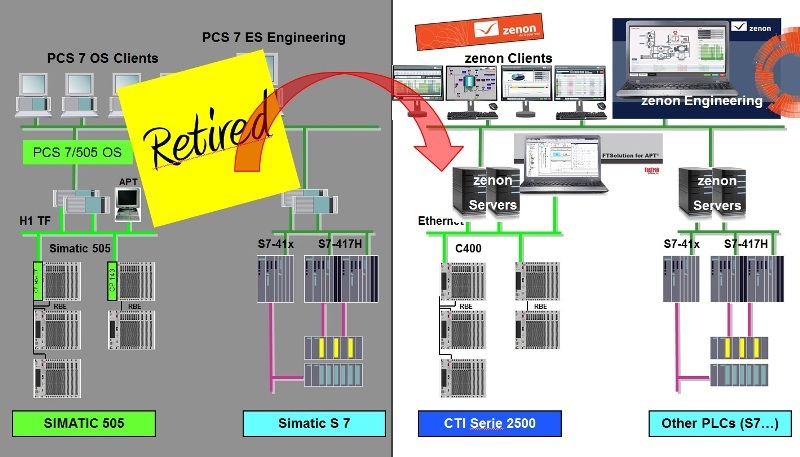 You can continue to use your proven SIMATIC® 505 or CTI 2500 Series® PLC technology, without any need to make hardware or software changes, which will affect your production. This enhancement of your existing PLC system can be made gradually, whenever you feel the need for it. You can also continue to use your long term investment in software development, by using the existing PLC Workshop software tool from FasTrak to import all your TISOFT™ files and automatically convert them into a modern and easy to use Windows® interface by the clic of a mouse. You will also soon be able to use the new APT™ replacement tool, currently under development and scheduled for a 2014 release, to be able to automatically convert your APT™ programs into a modern Windows® environment. To conclude, no need to jump on risky and costly PLC revamping when you can continue to run your existing programs and enhance your PLC at your rhythm, without the need to shut down your production, re-validate your processes and re-train all your engineers. We have some equally interesting information for your regarding the evolution of your current SCADA system, which is being discontinued by its manufacturer. NAPA INTERNATIONAL FRANCE can now offer you a very safe and cost effective turnkey solution in order to revamp your PCS 7/505® SCADA. – LESS RISK : because our Zenon SCADA solution works with the same proven PLC platform you are currently using, we can develop, install and validate your future new SCADA solution, while you are continuing to run your production and still using your existing SCADA system. After switching to your new SCADA, you can even keep the old one in place and you can run it in parallel for as long as you need. Last but not least, you don’t need to shut down your plant and re-commission lots of I/O re-wiring. – FASTER AND CHEAPER DEVELOPMENT : as already explained above, the first and probably most important cost saving is that you do not need to revamp and re-engineer your PLC. Thanks to certain developments made by our engineers, we are able to import INSTALL.TAG files from APT to automatically generate the variable and faceplate mechanisms in zenon, as well as historical archive definition for Analog Alarm and PID Loops. The engineering effort therefore mainly concentrates on reproducing the existing screens, a lower risk task. See below powerpoint presentation for more details.